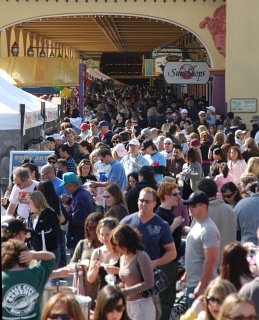 Last week, over fifty restaurants and amateur teams competed in the Santa Cruz Clam Chowder Cook Off. For twenty-four years, the Santa Cruz Boardwalk has hosted this fun (but insanely crowded) event. Tina and I showed up a few minutes after noon - just in time to participate in the public tasting. The schedule for the day was pretty straight forward. At 10:00am, the competitors get their ingredients prepared and equipment setup. The competition officially begins at 11:00am when cooking begins. The competitors have until 1:00pm to cook. 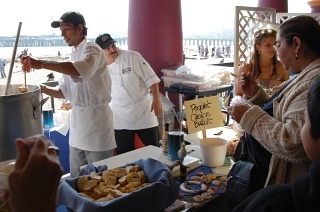 At 1:00pm, public tasting begins and the competitors must be ready to serve up their chowder. During the next couple hours, the competitors are called up by section number to provide samples for official judging. Then at 3:30pm, the final winners are announced. Tina and I picked up our tasting kits and set off to try ten different chowders. The crowd was so dense that we were lucky to get from one booth to another without spilling chowder all over ourselves. I also gave up trying to come up with a good strategy for selecting which chowders we'd taste. In fact, the lines for getting the chowder samples were a bit nebulous (with the end of one line blending right into the exit of the previous line), so you never really knew which booth you were waiting for. We actually didn't really like most of the chowders we tasted. It must be difficult to cook well when you're outside with portable burners and humungous aluminum vats filled with chowder ingredients. Several of the chowders I tasted had quite a bit too much salt. In fact, I had a headache for several hours after the event (probably a combination of the high salt intake, the bright sunshine, having to push and dodge around so many people, and enduring insanely loud repeated clanging of pots) and had to keep drinking water well into the evening. The best New England style chowder (which the competition calls Boston style chowder) that we tasted was from Severino's Bar & Grill (located in the Best Western Seacliff Inn in Aptos, California). I felt it tasted a bit floury, but unlike the other New England Chowders, it didn't taste weird (many were quite sweet and had strange herby flavors) or insanely salty. Severino's competed as "Charlie and the Chowder Factory" complete with a Gene Wilder Willy Wonka look-a-like. Our favorite Manhattan style chowder was from the Seascape Resort in Watsonville, California. The most annoying team at the Cook Off was the Bearded Clams from Capitola, California. 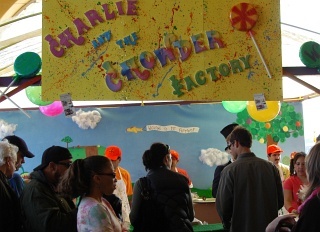 I didn't get a chance to taste their chowder, but they kept taking turns banging on their pots and using noise makers. I'm pretty sure my headache started when I was waiting in line nearby and had an empty 10 gallon aluminum pot banged loudly with a large metal ladle over and over and over. If you like clam chowder and can make it out to California during winter, make sure you stop by the Santa Cruz Clam Chowder Cook Off. If you can't, at least try making my clam chowder. The BEST Boston Clam Chowder I've ever tasted was at Mr. Lucky's Bar & Grill in Walnut Creek, California! It's absolutely PERFECT! Hi, I live near boston, what's "boston clam chowder?" 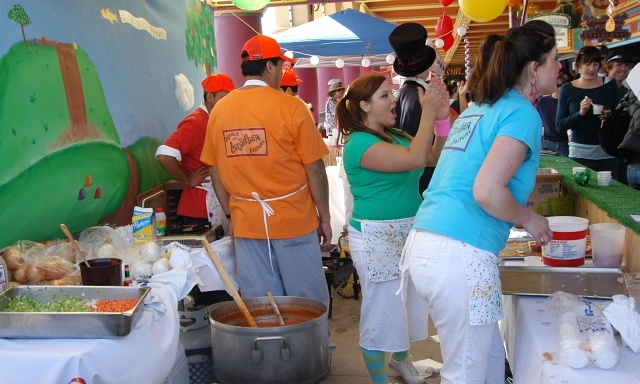 I noticed my hometown could realy use a community event like a clam chowwder cook off or a salom bbq cook off... just wonder if anyone has any suggestions on how to start organizing one? I am concerned about how people enter to competition, hopefully proceeds go for a charity, and supply of ingredients for each contestant and enough for population of tourists and locals...? lets put down our swords for once... and sow some great recipes! as an engineer... i crave efficiency. why can't we celebrate the bounty of foods given to us... rather than bounty up the foods with political agenda's? cooking... it is the only thing that separates us from the so-called "animals", in a scientific sense. why not take advantage... and expand our frontal lobes?